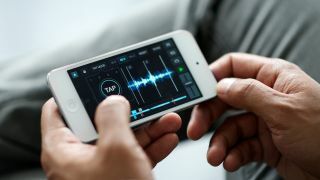 Native Instruments has released a version of its iOS DJing app Traktor DJ for iPhone and iPod touch. Traktor DJ for iPhone has a feature set almost identical to its excellent iPad sibling - which was released back in February - but reformatted for easier navigation on the device's smaller screen. As with the iPad version, you get two channels to mix with, each with an EQ section, filter and eight touchpad-controlled effects. There are also the same hot cues, the Freeze mode for on-the-fly beat slicing, the well-designed beat grid system and the recommendation engine. All these features - in our tests at least - appear to function in exactly the same way as those of the iPad version, so rather than delve into them here, check out our hands-on investigation and video test of Traktor DJ for iPad to see each in action. What does differ in this version, however, is the way in which Native Instruments makes use of the touchscreen real estate. The most noticeable difference to the interface is the deck selector along the left side of the main window. This is used to switch between the main window - in which both decks are displayed - and close-up views of each deck. Unlike the iPad version, the pop-up EQ and effects windows are only accessible from each deck's close view, and only one pop-up window can be viewed at any one time. As a result, it takes a few more taps and is a little trickier to, say, use filters or effects on two tracks at once. As such, the app does feel a little restricted compared to its bigger sibling. It makes sense that NI has gone with this approach though, as although it takes a little more navigation, the app doesn't feel particularly fiddly or too cramped. It's easy to make fairly subtle tweaks to EQ and effect levels, or correct beat issues, without getting all finger-tied. In particular the Freeze beat slice mode - which enlarges when you're zoomed in on one of the two tracks, as below - makes great use of the phone's screen space. On the whole, it seems that NI has done a stellar job of transferring Traktor DJ to the smaller screen. In our test we found that (understandably) it took our iPhone 4 slightly longer to process track info than our more powerful and up-to-date iPad, but for the most part the app ran smoothly and was exceptionally easy to use. Plus, just like the iPad version, users can hook the device up to a class compliant audio interface using Apple's Camera Connection kit. Traktor DJ for iPhone is available from the App Store now. And at £3.50/$4.99 it seems like a bargain entry window into the world of Traktor.